500 mg / capsule x 120 capsules (Total weigh 60 g) per bottle. The effectiveness of Korea Young Zhi+ (Ganoderma) spore can be utilizes and assimilated in the greatest degree only by breaking their wall. Korea Young Zhi+ (Ganoderma) spore is the essence of Ganoderma lucidum. It contains Ganoderma lucidum polysaccharides, Ganoderma lucidum peptides, triterpenes, amino acids, proteins and other active components. The components of Korea Young Zhi+ (Ganoderma) spore are more than 75 times of Ganoderma lucidum. Brief Description: 100% micro-broken, ganoderma sporoderm is developed by biology technology; it drains from more active pure of ganoderma with 100% micro-broken ganoderma spores. It includes the ingredient of ganoderma spores with active cells. The purpose is guarantee the ganoderma spores will keep the quality in stable after micro-broken. The purpose is more effective rather other Ganoderma Spore over 45 times. Main Ingredients: Korea Young Zhi+ (Ganoderma) Cracked Spore Powder. Effect: Improve physical strength; Helping sleep well; Keep life longer; Nutrition supply; Body-build adjustment; Keep your face as younger and beauty. All cell-wall broken Korea Young Zhi+ (Ganoderma) spore powder is made with carefully selected, fresh and ripened natural-log Korea Young Zhi+ (Ganoderma) spores by low temperature, physical means for the spore cell-wall breaking technology. The spore breakage rate reaches as high as 99%, making full use of Ganoderma lucidum triterpenes, polysaccharides, and other active components. Long-term usage could confer a healthy life. Nano GS 3375, this product is made of fresh selenium-enriched Ganoderma Lucidum Spore Powder which is produced by the Ganoderma Lucidum plantation of Healthwise. Spore power is collected by washed layer deposition method , clean and fresh , no impurities. ganoderma shell-broken spore powder can improve the efficacy and reduce side effects of chemotherapy,radiation therapy,increase the tolerance of cancer patient radiotherapy and chemotherapy. It is can prevent recurrence,transfer,conducive to patients’rehabilitation,reduce the cancer complications and prolong patient’s life.Taking spores can increase appetite,improve sleep,relieve pain,improve the spirit,renew body strength,and improve the quality of life ganoderma spore powder. We believe only the highest quality of natural herbal processing can achieve a comprehensive health care plan for an individual. We ensure 100% of our Ganoderma formulas are from internationally certified "GMP” (Good Manufacturing Practices) factory. We extensively test the raw herbs and the finished products for quality and purity. This ensures optimum potency, efficacy and safety to our customer base. Also, we have several international Lab Test Canters for the quality control of our exported products to international market. We value you as a customer and want you to be happy with your purchase. If you have any questions or suggestions for us, please do not hesitate to contact us. We will respond to your inquiry in a prompt and professional manner. All of our ganoderma products are made from 100% organic ganoderma. The ganoderma spore is high-shell-broken-rate, so it can be easy for human body to absorb. Besides there are rich ganoderma lucidum polysaccharides and triterpenes in our products which is good for health. We received lots of honors and certificates. We guarantee high quality of our products. *Patent on "Ganoderma Lucidum Products & Preparation Method"
What is Ganoderma Lucidum ( Ganoderma in US, Young Zhi in Korea, Lingzhi in China and Reishi in Japan)? Ganoderma Lucidum (also called Ganoderma on US, Young Zhi in Korea, Lingzhi in China and Reishi in Japan) is among the treasures of Chinese herbal medicine. It is also called the "miracle herb, long life herb, or imperial herb”, it has been proven through Korean, Japanese, US and Chinese pharmaceutical studies and clinical research that it is useful in helping to prevent certain type of discomforts and it also helps prolong human life. The popular ancient Chinese medical dictionary, "Shen Nong Ben Zao Jing” and "Ben Cao Gang Mu” (Compendium of Materia Medica), written in the Ming Dynasty, provides detailed descriptions of the effects of Ganoderma Lucidum. Therefore, Ganoderma Lucidum (G.L) has been effectively used for several thousand years. Korea, Japan, Us and Chinese scientists’ studies verified the pharmaceutical effects of Ganoderma Lucidum. The scientists of Chinese Academy of Sciences confirmed that the polysaccharides and triterpenes in Ganoderma are the key ingredients to maintaining a physiological balance within the human body. Polysaccharides and triterpenes also help prolong life. The Korea, Japan, US and Chinese government classified Ganoderma as both a food and a herbal medicine, and approved Ganoderma to be a safe herb as a dietary supplement with no toxicity in proper daily dosages. Ganoderma has been proven by the Korea, Japan and Chinese medicine literature to help maintain the body’s balance (immune system) and help alleviate certain discomforts, or discomforts related to the cardiac system, the brain vessels, the digestive, neural, endocrine, and respiratory systems. It is particularly effective in body cell maintenance, liver disorders (hepatitis) and slows down the aging process. Scientific studies showed that Ganoderma is rich in active pharmaceutical components, there are about a thousand compounds found in Ganoderma Lucidum and its spore, that can be divided into 10 different categories, including G.L polysaccharides, G.L. triterpenes, G.L. polypeptides, 16 types of amino acids (7 of which are indispensable to humans), proteins, steroids, mannitol, coumarin, alkaloids, organic acids (mainly fumarate), and micro-elements such as Ge, P, Fe, Ca, Mn, Zn, etc. The substances that have key physiological activity are trierponoides, polysaccharide, nucleotides, animo-acid, micro-element, organic-germanium and alkaloids, etc. Trierponoids compound: The trierponoide compound includes Granoderma Lucidum acid. Ganoderma Lucidum spore acid, Red Lingzhi spore lactones etc. tetracyclic or pentacyclic trierponoids, belongs to high-oxidized steral by-derivatives. Currently, about one hundred and eight triterpenoid compounds have been discovered by the scientist in the world. G.L. Spores spray continuously for a period of about 10 days. Collection of G.L. spores now, since its discovery by farmers, is much easier than the wild-planted G.L.. Farmers usually use a "mask” or a big envelope to hold the plant while it sprays the spores. Since G.L. spores were discovered and after various laboratory research and studies, it is highly recognized by world scientists as the essence of Ganoderma Lucidum. G.L. spores are a part of the G.L. mushroom, but it is the most important part of the G.L. 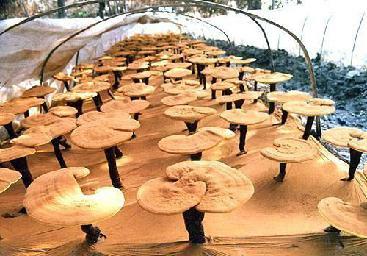 mushroom according to the Chinese scientific researchers. The G.L. spores are naturally produced only upon the maturity of the G.L. plant. Among the hundreds of species of G.L. mushrooms, only these cultivated species of spore are considered to be superior. These spores having the capacity of natural healing characteristics are far greater than that of the G.L. mushroom body. After the discovery of G.L. spores and along with the natural medical properties of these G.L. spores being recognized scientifically, the essence of G. L. mushroom plant, with its practical curative properties, has been formulated, and/or manufactured in different ways to benefit the human beings. Especially in China, there are over a thousand manufacturers that are manufacturing spores into a dietary health supplement, or as herbal medicines. Many Chinese herbal doctors highly recommend people who are suffering from poor immune system and metabolism system disorders recommend the use G.L. spore products together with the doctor’s treatment in order to achieve a full body recovery. With high natural curative factors, G.L. spores indeed make a great contribution to human beings in supporting the immune and metabolism systems. G.L. spore is considered the 3rd generation product of Ganoderma Lucidum mushroom plant. The 1st generation product of Ganoderma Lucidum mushroom is the plant body shell, which is usually sliced into pieces and boiled for hours to serve for people’s consumption. The 2nd generation product of Ganoderma Lucidum is the fine powder of the G.L. plant, which is gathered into capsules for intake. The 4th generation product of Ganoderma Lucidum mushroom product is the Shell-Broken Spores of Ganoderma Lucidum. The 5th generation product of Ganoderma Lucidum mushroom product is Ganderma Lucidum Shell-Broken spore Oil (G.L. triterpene extracted from spores). What are shell-broken spores of Ganoderma Lucidum? The shell-Broken Spores of the G.L. mushroom are a revolutionary scientific discovery. The shell of the G.L. spore is as hard as the shell of a coconut. It is almost impossible for a person’s digestive system to absorb the beneficial elements within the G.L. spore. Thus, manufacturers usually suggest that people boil the spores for at least 5 minutes, and boil the mushroom plant for at least 4 hours before ingesting to achieve better absorbance of the super essence of the G.L. mushroom spore. In 1998, the scientists of Chinese Academy of Sciences were the first in the world to successfully broken/cracked the spore cell by using the "physically breaking technology” for the purpose of easy absorbance. Normal temperature physical breaking technology is applied to break-open the tough covering or "husk” within a chamber. This (cold) processing method ensures that up to 98% of the Spores can be successfully shell-broken. Most importantly, it also ensures that all the medicinal properties or trace elements are not destroyed. The above described essence, as a matter of fact, is a complete natural medicinal formula or prescription with exceedingly high healing properties. Whereas, the common G.L. preparations which are processed using heat, etc., will suffer the inevitable loss of some, or most of the important trace elements, etc, thus affecting its natural healing properties. These trace elements are the catalysts that can contribute to reinforcing the healing process. That is why spore powder in its natural form possesses the efficacy or curative power that is ten times greater than those of the common G.L. preparations. Following this discovery, intensive research was undertaken by the Chinese Academy of Sciences, Nanjing Zhongke Group, which culminated into a new strain of special or super species of Spore-producing G.L. plants being artificially cultivated. This makes commercial production of the said spores feasible. With this new discovery, the said "Spore Powder” finally made it into the Chinese Pharmacopoeia as an herbal dietary supplement with extremely high curative properties. It enhances the body’s internal Qi (Energy) and increases the body’s internal self-defense mechanisms against the bad cells. Modern scientific researchers found that Lingzhi enhances the function of monocytic macrophages by activating the synthesis of interleukin. It enhances the blood synthesis capacity, particularly at the white blood cell level. Proper and sustained usage of Lingzhi produces an inhibiting effect on cell mutation, and becomes one of the most effective dietary supplements for body maintenance. It can be used as a dietary supplement in combination with clinical tumor treatments, and with any other daily food. It is said Ganoderma is able to help protect the liver from damage caused by various chemical and biological treatments. Ganoderma can be used before liver discomforts happen, or afterward in a combination treatment plan as a dietary supplement. Ganoderma’s primary function is to help speed up the metabolism and reduce the toxic substances in the liver. Ganoderma may also help relieve certain discomforts associated with chronic hepatitis and minimizes associated and related symptoms such as dizziness and fatigue, poor appetite, etc. Chinese and Japanese clinical studies and experiments with animals confirm Ganoderma can effectively dilate coronary arteries, increase coronary blood vessel flow, and improve circulation in cardiac muscle capillaries. This, in turn, may increase the supply of oxygen and energy to cardiac muscles. It may help protect the heart from a shortage of blood supply, and may also help prevent heart disease and nausea. Ganoderma may also be effective in helping to balance blood cholesterol by preventing the formation of arterial athermanous. If athermanous patches are already formed, Ganoderma may help reduce the cholesterol in the arterial wall and soften the blood vessel to avoid further damage. It may improve blood circulation and prevent the aggregation of blood platelets. The polysaccharides and polypeptides found in Ganoderma may help delay aging through the following according to Japanese researches: Ganoderma polysaccharides may help enhance DNA synthesis in the cell nucleus, which may result in slowing aging. In Korea and China, Ganoderma is widely used in the treatment of neurasthenia and insomnia. Scientists found that the extracts from Ganoderma work on the central nervous system, so as to calm the body. In ancient Korea, Japan and Chinese medical publications, Ganoderma was said to "stabilize emotion”, "increase wisdom”, and "enhance memory power”. Recent reports state that Ganoderma has a prominent effect on insomnia caused by neurasthenia. Generally, it takes a period of 10 to 15 days for sleep patterns to improve, appetite to increase and body weight to stabilize. Ganoderma has a relatively strong effect on the central nervous system. To date, the effects of Ganoderma on neurasthenia and insomnia has been clearly described and stated in the published "China State Medicine Book”. Laboratory tests in China & Japan have shown that Ganoderma can effectively balance the blood pressure. Ganoderma is currently being used in Korea, Japan and Chinese clinics to help maintain patients’ blood pressures; these test cases have been reported to have an 88% success rate. It was found that Ganoderma also extends and stabilizes the effects of other blood pressure medicines. It has been found by Korean, Japanese and Chinese clinically that Ganoderma"Ganoderma B and C” may help lower blood glucose levels. In Korea, Japan, US and China, research has shown that by enhancing utilization of blood glucose by body tissues, Ganoderma can serve as a supplement to insulin to inhibit the release of fatty acids. Chinese studies reflect that blood glucose can be reduced from 173 to 116, cholesterol from 233 to 179, and Beta-protein from 580 to 465. Both the popular ancient Chinese medical publications, "Shen Nong Ben Cao Jing” and "Ben Cao Gang Mu” (Compendium of Materia Medica), written in the Han and Ming Dynasties, provide detailed descriptions of the effects of Ganoderma on respiratory disorders. Ganoderma may stop coughing, may help clear sputum, and may help suppress asthma. It may also relieve symptoms of related respiratory discomforts. Since Ganoderma activates the immune system, it may help prevent contracting the flu and other common colds according to some scientific researches. If the body is invaded by an antigen that elicits an immunological reaction leading to various abnormalities and immunopathological symptoms, Ganoderma may be effective in suppressing negative reactions and help the body recover more rapidly. Japan experiments show that Ganoderma helps stop the release of hyper-reactive factors and helps prevent the development of allergic reactions. Ganoderma has been found to help alleviate the symptoms of asthma, joints discomforts, heart discomforts, allergic discomforts and certain skin discomforts. Ganoderma Lucidum may retain and regulate water in the skin and helps maintain the skin’s elasticity, keeping the skin hydrated and smooth. It may also help to inhibit the formation and deposit of melanin in skin. Today, Ganoderma Lucidum beauty care products are becoming new stars in the cosmetic industry. By adding Lingzhi into daily food, not only can one’s skin be kept smooth but it may also help prevent bacterial infections according to Japanese researches. Besides, Ganoderma has been reported by world scientific researchers that it may help stimulate blood synthesis. Ganoderma Lucidum may help enable the body to block viral infections. Ganoderma may also help increase the body’s tolerance against polluted environments. It may be beneficial to suppress over-contraction of the uterine muscles for those who have irregular menstrual cycles. Ganoderma may also be effective in alleviating retinal, brain, and abnormal muscular development issues. Ganoderma Lucidum may act as a pain reliever for headaches according to Chinese and Japanese researches. Matured Ganoderma fruiting body may produce million spores. 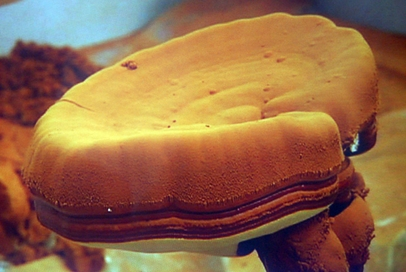 The life cycle of Ganoderma lucidum is begin with the spore which germinates to produce hypha in favorable conditions. Multiple hyphae fuse together to form a network of threads called mycelium. Eventually, mycelium will grow to produce matured fruiting body and the life cycle of Ganoderma starts again.